Sunday Stash Spring Bunny Fun! This week for Sunday Stash I am already looking forward to Spring! It is no secret that I have a great dislike for Winter and cold weather. If it were possible for humans to hibernate, I would be the very first to attempt it! Snow is a four letter s word and is best left to be shared on Christmas cards sent from a warm location like Arizona or better yet...HAWAII! The fabric collection this week the very bright and colorful Spring Bunny Fun by Stacy Iest Hsu for Moda Fabrics! I love that the colors chosen are not the typical washed out pastels of Springtime past! These updated brights ( including a fabulous orange) are perfect for everyone that adores colors that have impact! Along with the atypical fabric colors, other than the white, the Aurifil thread choices are cheery companions to the mix! The thread colors are 2024, 2405, 2835, 4657, 3770 and 2425. 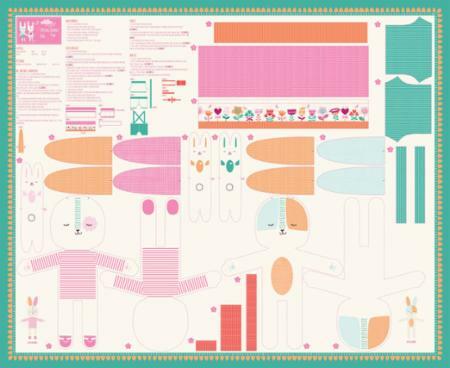 This collection also has a Spring Bunny Fun Panel for making a stuffed bunnies for the littles in your life! 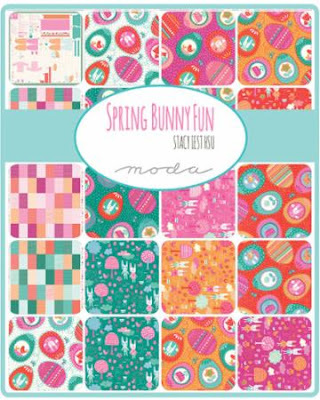 For more information about this delightful collection visit Moda Fabrics here. This collection will be available Feb 2017 in your favorite local and online quilt shops! 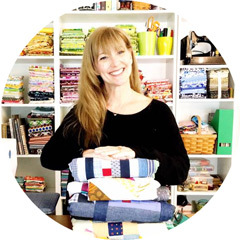 This fabric collection is AMAZING! There are so few spring / Easter prints out there and this one is fun! The cut and sew bunnies are adorable and Stacy was amazing to talk to about these prints...we will definitely be featuring them in our spring Cotton Cuts box. Thank you for highlighting this collection!